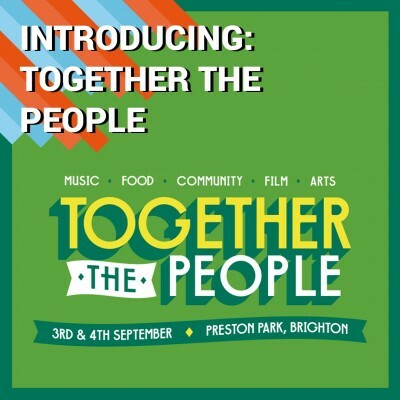 Together The People is a festival that builds on the wonderful counter-culture epicentre of Brighton and unites the very best of East Sussex music, film, art, food and culture into a dynamic weekend event. Driven by true community spirit, the event offers a delightfully eclectic range of music, exciting performing arts, cutting edge film and talks from inspiring figures. The festival is about to enjoy its second year by gathering a huge cast of fantastic acts including the truly inspirational Brian Wilson performing the seminal Beach Boys album Pet Sounds, stylish androgyny-rockers Suede, darkly enigmatic psyche enthusiasts The Horrors and Joy Division/New Order bassist Peter Hook with his band The Light, plus much more! We spoke to Festival Director Alex Murray about the creation of the fantastic festival, the best local talent to check out and the various excellent activities that make Together The People truly unique. Click HERE for your Together The People tickets. Together The People is a relatively young festival. How did you first get started? All of the directors are Brighton residents and have been active in the live music scene for some years in various capacities. Individually we had all wanted to organise an outdoor festival in Brighton that truly represented what the city is about and felt that there was a demand for a music festival that did that while programming a diverse programme of artists. Despite only announcing our first festival just over a year ago with our second coming up in September it actually took a few years of work prior to that to get the whole thing going. What is your role in organising the festival and what challenges do you face? As well as a director, my main role is as one of the bookers of the festival as well as helping with marketing strategy and ticketing, although as a small, independent festival you often find you do whatever needs doing to make the event run smoothly! The main challenge is to come up with a fantastic line up and offer a festival experience that is different to what everyone else is offering. This is a challenge I really enjoy, in year one I felt we did a good job but this year will be an improvement on that and we’re working hard to make sure our audience really enjoys the weekend. You have an amazing line-up combing fantastic new acts with truly great headliners. How do you make the decision of who to play? Thanks, we’re really happy with the line up this year, Brian Wilson as a UK exclusive was a massive coup for us in only our second year and Suede are one of the UK’s finest bands so we couldn’t be happier with the headliners. Getting to the position of confirming an artist varies massively – there are a lot of meetings and discussions all the time, some which take months, others go from an enquiry to confirmation in a space of a few days. We try to offer a diverse line up that will offer something new to everyone in the audience and the key really is to book great acts that will work on a festival stage regardless of the genre. Brighton has a well-earned reputation for being a hub of creativity. Have you drawn upon the local music scene when making your selections and are there any emerging acts you can recommend? You’re right, Brighton is fantastic! We have a real spread of locals across the bill – Brett & Matt of Suede are from nearby Burgess Hill, Gaz Coombes lived here for a considerable time, then you have the likes of Fickle Friends and Jacko Hooper who are getting loads of attention recently while Daniel Wakeford and Chris T-T who have a real cult following. We have also partnered with the music college BIMM Brighton who have a stage each day full of new Brighton-based talent which is well worth checking out. Together The People has more to offer on top of the great music. What can you tell us about the Incredible Moving Picture House Cinema? It deserves the ‘Incredible’ title that’s for sure. It is an artic lorry that transforms into a 100-seater cinema, which is expertly programmed by our partners Duke of York’s and Dukes at Komedia. Being inside it genuinely feels like you are inside a proper cinema, with comfortable seats and an amazing picture & sound system. We’ve not announced the programme yet, but there will be something for everyone, young and old! And who will be taking to the Soapbox Stage? The Soapbox stage is our performance and community stage which last year saw debates and talks, including an appearance from Brighton Pavillion MP Caroline Lucas. This year we have a spoken word set from internationally renowned MCs Sage Francis & B. Dolan, Poets vs MCs hosting a series of battle raps, family fun provided by Music for Aardvarks, Poppies Parties, Loopy Lou & more, acoustic performances and debates, talks and performance art. It’s a real mixed bag that represents Brighton’s creativity and social awareness really well. The festival makes a dedicated effort to be socially conscious. Can you tell us more about your involvement with Brighton Housing Trust and any other progressive projects associated with Together The People? Yes, last year our charity partner was Brighton Housing Trust, who as the name suggests do sterling work locally combating homelessness, creating opportunities and promoting change. We raised just over £2,000 for them last year and helped raise awareness of their work. We also had presence onsite from Sea Shepherd UK and Gig Buddies. This year we will have similar charity involvement which will be announced soon! Outside of that, we are also teaming up with Photoworks on commissioning an exhibition of new photography by University of Brighton students that will show at TTP and during October at Brighton Photo Biennial 2016 as well as several of the city's libraries over the summer. Photoworks will also be running family-friendly photography workshops at the Photoworks Photography Tent at the festival. The project has been supported using public funding by the National Lottery through Arts Council England, which we’re very grateful for as it’s a project we’re really excited about. We’re really excited about Together The People. What are your hopes for the festival’s future? Us too! We hope that the festival will become a staple on the cultural calendar for Brightonians and that we will be able to improve on our artistic offering each year so that people can feel proud that such a festival not only happens here, but is also organised and run by Brightonians – The festival is run and supplied exclusively by local companies, whether it is the delicious food onsite, the bar staff, the lighting, security, even the power is supplied by Firefly, a company based in Lewes who provide us with solar panels and bio-diesel! Long may that continue and we can celebrate Brighton through Together The People. For information on other gigs and festivals available through Gigantic Click HERE and subscribe to our Newsletter.